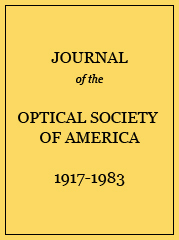 A Jamin interferometer was used to measure the thermal coefficient of the refractive index of water for sodium light (λ=5893A) from −5°C to +25°C. From this was calculated the index-temperature curve over the same range. The results agree with those found by the Bureau of Standards for water within the experimental error, which is between 1×10−6 and 2×10−6 index unit per degree centigrade. No differences were found between samples of water from different sources, nor was any change observed in the same sample over periods of weeks. No anomalies or irregularities in behavior were found in the average dn/dT. The possibility of a small consistent difference between the dn/dT versus T curves taken with rising and falling temperatures near 0°C is still under investigation.